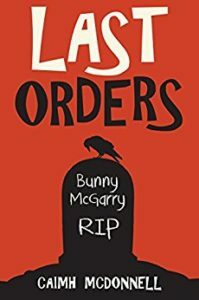 It’s kind of hard to not see the spoiler alert when the book cover has the tombstone of Bunny McCarry AND the book is called Last Orders! The book picks up where the third in the Dublin Trilogy (this is the fourth book) left off with Bridgit and Paul fighting and their fledgling detective agency falling apart around them. Bunny makes brief appearances as he deals with his past demons coming back to haunt him…literally haunting him. I’ve enjoyed all four of the Dublin Trilogy and look forward to the fifth…if only to see if you know who is really dead. You never know! This article was published on Aug 6, 2018 . It is tagged bunny mcgarry, caihm mcdonell, Last Orders. You can follow any responses to this article through the comment RSS feed.